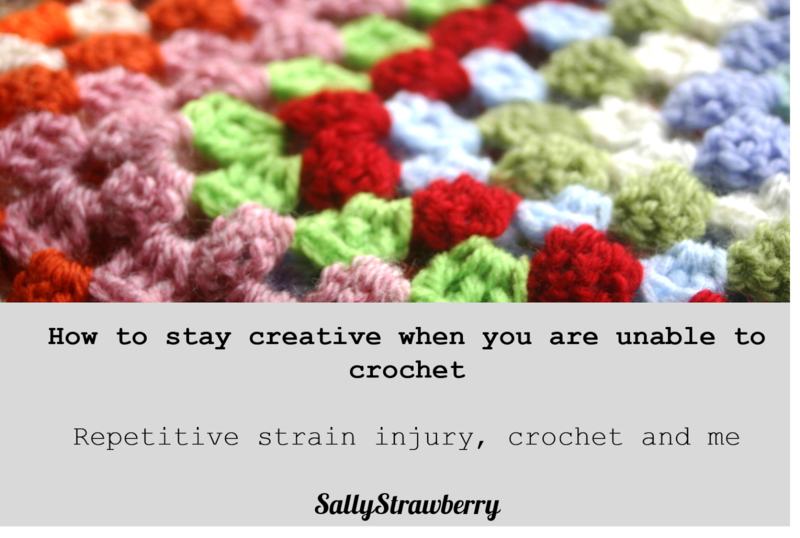 This post is for those of us who suffer from repetitive strain injury from crochet or knitting. I wrote about my experiences back in 2014 and an update on Monday. The Crochet Project also wrote a fantastic post about the same subject yesterday and I definitely recommend you give it a read, regardless of whether you are having any problems. With this post I want to show how you can have a creative life outside of crochet when pain strikes, and some of the things I like to do to keep me on the straight and narrow when crochet went out of the window. Your long term health is more important than finishing that blanket for a friends new baby, or making stock for your craft fair. A baby will grow into a toddler and toddlers need blankets too. You also probably already have enough stock so please don't panic. For me, realising this was not easy and I put my body under so much strain crocheting that I was out of the crochet game for a long time. imploding in on myself at this time, but it has also caused me quite a lot of physical damage. I hope that one day I will recover completely but for now I have to play it by ear, watch out for the onset of pain in my wrists and take complete breaks when I need to. Initially I was so frustrated that I couldn't crochet but rather than getting stressed about it I have come to use it as an opportunity to do other things I used to love pre-crochet obsession. I thought maybe this list might help those of you in a similar situation, worrying what your evenings will look like now that crochet is out of the picture. Listen to music...put some old records on and reminisce, listen to that album you have been meaning to get round to. Try some other crafts if possible-machine sewing may be possible without pain. Exercise- walk, swim- I found that swimming is GREAT for sore wrists and is something I really want to get back in to. Plan future projects for when you get better. Put together that photo album you have been putting off. I hope these are of some help. What do you do when you are unable to crochet? I'm currently off knitting and crochet because I've sprained my left elbow and wrist in a car crash and as they would be my first choice stress relief I'm missing it desperately! I'm going to get my calligraphy out though (thank goodness I'm right handed), read books , and I'm getting good at dictating blog comments on my phone! !